Narendra Modi was briefed about the BrahMos supersonic cruise missile system by Cdr. Ashotoosh Mehra (C). The BrahMos Aerospace has contributed significantly in strengthening the defence and security of the nation. 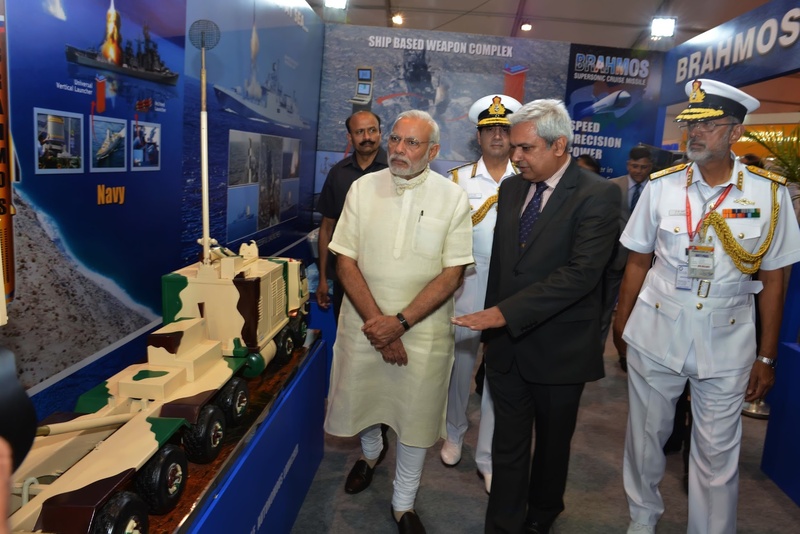 Prime Minister Shri Narendra Modi visited the BrahMos pavilion on Sunday during the ongoing International Fleet Review (IFR-16) being hosted by Indian Navy & the Govt. of India. BrahMos Aerospace is participating in the Maritime Exhibition (MAREX) which is a part of the grand naval celebrations, in Visakhapatnam. Shri Narendra Modi was briefed about the BrahMos supersonic cruise missile system, displayed in land, sea, sub-sea and air versions by Cdr. Ashotoosh Mehra, DGM — Naval system, BrahMos. The Prime Minister praised the BrahMos missile system — a successful role-model for 'Make In India'. The JV has contributed significantly in strengthening the defence and security of the nation. The Indian-Russian Joint Venture BrahMos Aerospace is exhibiting naval and land variants of BrahMos system which have been inducted in the Indian Army and Navy. Development and integration of the air-launched version of BrahMos is currently at an advanced stage and the missile is expected to be flight tested from onboard a Su-30MKI aircraft in the coming months. BrahMos supersonic cruise missile has a flight range of 290 km with a speed of 2.8 Mach. The International Fleet Review (IFR) officially kicked off at Visakhapatnam with wreath laying on 4th Feb, 2016. With the theme "United through Oceans", the IFR witnessed participation of around 50 Navies, 90 ships, including 24 warships, and over 70 aircraft. Ships of the Indian Coast Guard and mercantile marine also took part in the event.